Following Lin Homer’s excellent blog on Sickness absence in the Civil Service in November, I wanted to write on mental ill health, the workplace, and the work we are doing across government to increase awareness and provide support to those with mental health problems, both within the Civil Service and beyond. Mental health problems are the leading cause of sickness absence and largest single cause of disability in the UK. For the Civil Service, this means that departments lose between 0.2 and 2.5 days for each member of staff per year as a result of mental ill health. 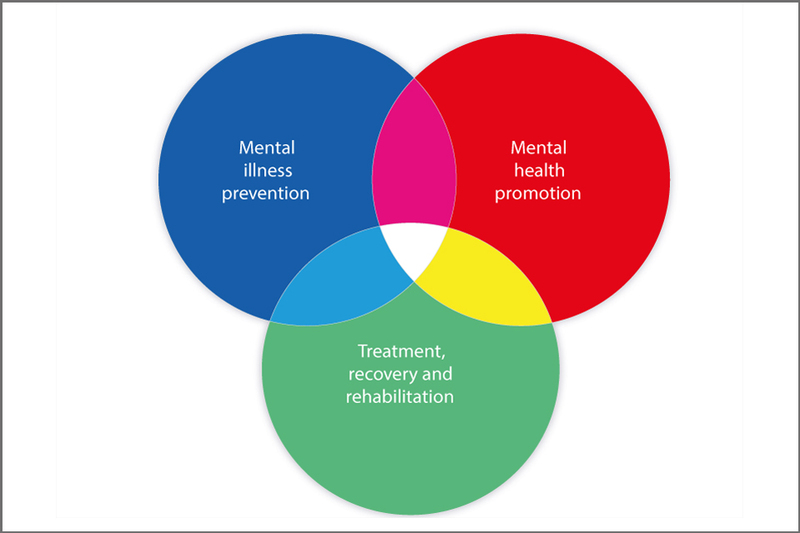 The cross-Government strategy No Health Without Mental Health, published in February 2011, emphasised that ‘parity of esteem’ - equal priority for mental as for physical health - is critical to addressing the fact that 75% of people with mental health conditions do not access services. It is called for all of us to confront the stigma that often attaches to people with mental health conditions. At the Department of Health we are leading an expansion of the programme - Improving Access to Psychological Therapy – that supports early intervention. By March over 900,000 people will be able to access ‘talking therapies’ and people can refer themselves to these services. We know this works because almost 92,000 people moved off sick-pay and benefits between October 2008 and June 2014 after accessing help. With nearly 1 in 2 on sickness benefits and 1 in 4 on unemployment benefits having a mental health condition it's particularly important we find new ways of supporting individuals back to work and ensuring a short spell of sickness absence doesn’t lead to someone falling out of work. Being in work is an integral part of recovery from mental ill health and maintaining mental health. Given the right support, the vast majority of people with mental ill health can take up or stay in employment. We also know that good employers can make a real difference. The Department of Health takes this responsibility very seriously and we are signatories to the Time to Change pledge to reduce stigma on mental health in the workplace: our staff-led video on mental health issues has also been used on the Time to Change Website and as inspiration for other government Departments. The Department has also introduced Mental Health First Aid training, including training 12 of our own staff as trainers to roll out the programme to others. We also work with the Charity for Civil Servants to develop guidance and support to all civil servants with mental health issues – including for the managers of staff with mental health issues. It is well worth a visit to the charity’s website as they have lots of self-help and mutual aid resources to support health and well-being, free and available to all of us and our families. Exactly the same thing is happening in DfE. As a union rep, I have lost count of the number of member I have helped and supported in their battles with managers, where both the performance and attendance management processes are doing nothing except exacerbating longstanding illnesses and leading to the onset in others. Managers say that they understand, but then in the next breath say that they have to place someone on a written warning because their level of attendance is deemed unacceptable, or they are not meeting acceptable behaviours (which is all subjective anyway when you consider that what one manager deems "acceptable" another will not). The working environment does not help either. Another poster here has referred to battery hens, well I have to say that my current office ranks as the most soul destroying workplace I have ever occupied. Long rows of desks, with very little space inbetween and minimal privacy just adds to the demoralisation of staff and I can understand why such a layout could heighten anxiety where this is a symptom of certain mental illnesses. I was dismissed for gross misconduct not long after a period of recovery from stress related illness. My team helped me back to a good level of recovery with patience and understanding only to be accused of being a security risk because on an error in dealing with a client. The union rep did all he could but little support from union itself. there seems to be a lot of mental health news about at the moment and i can speak from experience of this, if people were not made to be under so much pressure at work, there would be far less sickness days. There seems to be no understanding in local offices of how to deal with this. People 'on the ground, front line' are just not being listened to and i'm afraid the problem won't go away just more prescriptions handed out! My understanding is as with the first comment. My experiences of the past few years (yes years) have been that some in the Department for Work and Pensions appear to spend much of their working time acting against the well-being of staff. There's a limited voluntary exit scheme at present. Could it be that managers are trying to both save costs and ruin the re-employment prospects of those who want to exit with a fair severance package? If you are sick, it doesn't matter if it is genuine or not, you get a warning, if you hit the now even tighter consideration points. That is mandatory, no matter what guidence says, because if a warning isn't given, then the manager has to justify it to senior managers. Too many warnings you are sacked. I don't see a support mechanism in there at all. Open plan battery chicken working environments with ever reducing space and constant background noise are deadly for those doing complex work who need peace and quiet in order to THINK. Not efficient and high potential for error. Ironically, the link "Improving Access to Psychological Therapies" in the article doesn't work. I have recently completed a free Mental Health Awareness course run by my local college and I found it so useful that I think everyone should take it. It has given me a far greater understanding of mental health issues ranging from stress & depression to paranoia & dementia. These are issues that can affect us all at some stage, whether it's yourself who is suffering or someone close to you. We should be able to be open about mental health problems and not feel too threatened to share our experiences and I think it's good that these incentives are being encouraged and only hope that Managers receive the correct training to deal with such issues. Unfortunately, in practice there is a disconnect between Perm Secs signing the 'Time to Change' pledge - either through a genuine desire to want to improve the working environment for people with mental ill health, or through wanting to be seen to be 'doing something' - and the intransigence of corporate structures, particularly HR, in supporting individuals with a mental health condition to fulfil their potential. I'm very fortunate to work in an open minded and incredibly supportive team, but this is not backed up by the attitude of HR. For there to be a real change in the way people with mental ill health are treated at work, corporate structures need to be able to respond flexibly and appropriately and those who work in them must be encouraged and allowed to treat people as individuals and not problems. I concur strongly with the preceding comments. It is acknowledged in the article that 75% of people do not access services for mental health issues. What is not stated is that many people have never been diagnosed and may not even be aware that they may have a mental health issue. This applies to Civil Service staff as much as it does wider society. The introduction of PMR with such an inordinately high emphasis on behaviour in relation to achievements means that many staff in this position are likely to fall foul of the system and receive a lower marking than they deserve. Was this ever taken into account? I rather doubt it. Have to agree with comments above. People are being made unwell by the pressures bearing down on them. If this was industrial smog clogging lungs, we'd be passing a clean air Act. If this was employers giving asbestosis by exposing them to hazardous materials, they would be taken to court. We know full well that people in the workplace are too often frightened, either my the chances of losing their job or by the impossibility of doing the job they are charged with doing. Employers are culpable, and support policies are springing up so they can demonstrate they have done what they reasonably can. But too often, the messages come across as patronising: 'we' must understand that 'they' are suffering from mental illness, and 'we' must make adjustments. Its a bit like standing on someone's chest and saying you understand why they can't breathe, as though that makes it alright. What 'we' need to do is get off 'their' chest so they can breathe freely again. Its interesting to speculate what might happen if quantitive easing was used to support the cost of keeping people in dignified work rather than giving it to lenders who do not seem to have delivered any apparent great benefit to the economy. If sickness absence is costing the economy, what is malpractice in the banking industry costing the economy? And which group - the moral and mentally unwwell, or the sociopathic and carefree - is actually more worthy of support. Dear Ed. I couldn't see well as I typed and the above post contains a few typos and missing words, which I cannot edit/correct. If you could, I'd be grateful. thanks. During my 14 years in the Department it has widely varied depending on Management as to how supported I have been. Fortunately my Clinical depression, panic attacks and OCD haven't led to issues with my sickness, but it has been a close call in the past when pushed to my very limits mentally whilst at work. Fortunately the team I am in now is great and so is my line manager, but sadly for many, the support only seems to be there when the Union is involved or Managers actually care. when managers operate the "curtains" psychology method of "pull yourself together" and the "well i dont feel that way" of justifying increased workloads, there will be no real help- nor an understanding that stress affects different people in different ways! I don't believe many Office Managers or Line Managers care about the Health of Staff. I have been suffering with Depression for a number of years and have good and bad days. When I'm having a bad day I get no support or understanding and when I have been signed of by a Doctor for 10 working days I am placed on disciplinary procedures and unable to apply for promotion during this time. Totally unfair especially when a EO recruitment excerise takes place. name not supplied because of fear of reprisals. Please can we stop referring to Mental Health Conditions as 'problems'? Given that this page is all about supporting staff and banishing stigma, using the outdated and potentially offensive term is wholly inappropriate. Its totally ridiculous that people should be marginalised and stigmatised particularly as stress affects 1out of 2 people sometime in their lives. I learned this shocking but not- so surprising statistic from an NHS Understanding Stress course I am presently attending. How timely that this article should now appear...i am currently "fighting" to remain in work having battled for the last year whilst trying to manage a recently diagnosed mental health condition. At my most vulnerable time i've been forced to successfully appeal procedurally incorrect Attendance Management decisions and challenge the reduction of my Disabled Employee Consideration Point. I cannot underestimate the damanging effect this has had on my overall wellbeing, especially whilst at work. Having read the comments above with which i agree, yes it's Time To Change - It's time for the DWP to ensure that their managers have up to date knowlegde of Attendance Management policy/guidance and to be flexible with their application of it. To be upskilled on how to support staff in the work place with mental health conditions and aware of the guidance and support tools that are out there, but sometimes difficult and time consuming to locate. There is currently a massive conflict between what the department is saying and what they are actually doing to staff with less obvious conditions such as mental health. Staff who actually want to remain in work are routinely being dismissed using the Attendance Management policy as a tool for this and not as the supportive measure it should be - How sad ? Whilst it is applaudable that you are taking some steps to improve things for staff with MH iconditions , it doesnt go far enough. Staff are still enduring stigmatisation and ignorance on a daily basis. Use of welfare and advocates is helpful but only if the the people given the role are the right people for this role, and are not known to have caused issues for the staff with MH conditions .Unfortunately this does not appear to be being considered, which makes people like me feel that there is no point in going to internal resources, and have to seek help from external sources instead when any work related MH concerns arise. I have the feeling along with most of the other people here that mental health is NOT supported. I myself have a mental health issue and feel if i am ill or need to leave work early due to my condition, that i will be disiplined on my return. My manager and HEO say that they are aware and are willing to help but still make me feel isolated and offer no support. the particular office i work in a woman commited suicide a few years ago, ironically on her way to work here. due to this i feel that there should be a major failsafe in place to help people and not have everyone worried they will be fired due to an increased absence record due to mental health. this issue needs to change fast and to help everyone who suffers, buy acually offering support and understanding, instead of worry and ill health. Glad to see comments about the stress and mental illness caused by PMR. Unfortunately there are still some who think PMR is 'driving up performance'. Perhaps we should all report the stress and anxiety caused by PMR as an accident. By doing this we might be able to persuade those in power that 'Time to Change' means abandoning PMR. My doctor referred me to IAPS too many months ago, I eventually (some two or more months later) had an initial assessment which presumably ticked a box and am still awaiting the start of therapy/support which I was informed, during the assessment, was needed as a priority. I therefore find it difficult to reconcile the sentence above i.e." At the Department of Health we are leading an expansion of the programme – Improving Access to Psychological Therapy – that supports early intervention." I appreciate the pressures the NHS is under and if there was any way I could cure myself I most certainly would. It does not effect my work, at least in terms of time off, colleagues opinions may differ in terms of my ability to remember or recognise but I couldn't but praise their support. I certainly feel 'Lindsay Smith' above has a point as we still have too many who in the absence of broken limbs or blood cannot or refuse to recognise an illness, I just hope for their sake they never have to suffer the same fate. To be fair many managers are appreciative of the condition and I know this issue has been a point for consideration for two or three years now but I guess from the comments above it seems some still priorotise attendance management statistics over the wellbeing of staff. Hopefully 2015 will bring a positive leap forward. Paramount there is a cultural issue within the MOD developing that is not being policed. Its such a shame bring back the old MOD. It raises lots of concerns when a local doctor is not surprised where we work when visitng him ("You're not the first with this issue coming from that local offices"). Some management think its ok to be invisiable, lack of moral fibre, rude, ignorant and too busy to listen to you. The reason why we are suffering with Mental Health issues is because we want to be heard!. Management have a duty of care, we are people and we have a right to a view/opinion. All I can say is that the counsellors will never be out of a job. Mental Health is a condition that affects you when your least expecting it. Its like a snowball starts of small and ends up the size of a house. Break the issue down and only address the sections that you can at any one time. If there is anyone that supports you consistently and it helps you its the person nearest to you usually. Trust is such a big issue and working for the MOD prevents you to trust people which messes with our brains. Shame but factually correct!.Lifes like a box of chocolates and having a counsellor is like dipping in to it! On a postive note I had a very recent family bereavement and I cant thank the counsellor from here for making me see today is a better day than yesterday. And please, please respect that there are is a very limited number of people that I am comfortable talking about my issue with me. Don't put the onus on me to reduce the stigma – I have enough problems of my own thanks. The policies need improving first. I have been in the Civil Sevrvice for over 5 years. During that time I have had 2 breakdowns. One was very serious. I now suffer with a serious aniexty dissorder, depression and Irritable Bowel Syndrome (which I have been told is linked with my anxiety). I had 2 spells of sickness last year due to IBS. I have now been given a final written warning. Today I am suffering a great deal with my stomach and I keep running to the toilets. People can see how ill I am physically. My metal state is not good either as I am in so much pain. However I will lose my job if I go home ill.
Management do not seem to care that the root cause of my illness is the working conditions. I think the PMR is there simply to get rid of people who have a dissability. They have to employ people with dissabilites to "tick the boxes" but once employed they just try to get rid of you. I have been offered a stress assessment??? This aparently would be completed by someone NOT qualified as a mental health practitioner. It really does feel like being bullied into quitting. They will never change anything. As a civil servant you are nothing but a number. People with mental health issues often struggle to do even the simplest of things without the hassle of trying to access "support" which usually consists of a website that directs you round in circles, leaving you more overwhelmed than ever. Time to reinstate the Welfare Officer position as nothing can beat a human being who is PROPERLY trained to help. PMR is putting additional unnecessary strain onto everybody, but is unbearable for those with mental health challenges. Another huge problem is lying in wait - increases to the State Pension age mean that many of us will still be working and suffering from dementia. I totally agree with everything Michael has said. I am in pretty much the same position, having lived with Chronic Clinical Depression for more than 20 years with related anxiety and IBS. I had a period of sickness in 2013 due to my depression and the attitude of my then manager was very much "pull yourself together" and I received no support from the department just a Stage 2 written warning on my return! I started to become unwell again early in 2014 and this was directly connected to the work I was doing at that time I was repeatedly refused a move even though this was recommended by my GP, Mental Health Team and OHS! This resulted in my being off sick for 9 months when they finally agreed to a change of job and I returned to work. I had a more understanding manager at that time and instead of going to a decision maker she extended my Stage 2 for a further 10 weeks. The review period is now up and I live in fear of becoming unwell again and having to take time off. I have to say that, but for the support I received from my TU rep things could have been far worse. I have to say that from personal experience it is great that the Organisation has started to acknowledge that there is a need to increase aware and understanding of Mental Health. What the organisation does however still need to do is acknowledge the various contributing factors that have resulted in an increase in staff experiencing mental health related issues. Certainly the pay freeze and subsequent very small pay increases against rising living costs is one of the major issues being faced by staff, as well overstretch which is impacting on staff having an ideal work / life balance. The orgainsation also needs to address the way in which the performance of its staff that are suffering from mental health related issues are managed. It has concerned me the number of colleagues that I have met who have found themselves placed on a performance management plan or performance improvement plan by their Line Managers, instead of the organisation or their Line Managers looking at ways in which they might give better support to that person to get them back on track. So its a good start, but there is still much that needs to done! I have suffered with depression for over 9 years, My Line Manager moved me to a new position which I explained I would not be able to cope with, I received no support, understanding or sympathy from her. This resulted in me having time off sick due to work related stress. When I returned to work I was then issued with a written warning about my sick record. I appealed against that decision and my appeal was also refused. I have worked in this dept for 30 years and have always gone into work despite my condition. I feel I have been treated appalling and the Managers do not care whatsoever about the welfare of the staff, they seem to want to drive staff out so they can replace them with agency workers who they can then get rid of without having to pay them redundancy. Will any of these honest blogs be read by the ministers/seo's etc responspible for staff welfare? I fear not. I have been in the Civil service for 31 years. When I joined back in 1984 the managers of each individual office cared for their staff EVEN if they did not understand particular conditions. There where no threats of dismissal just time & support to get well & maintain a level of wellness. Now, what ever the condition its warnings & sackings. Intersting to note that only 7.3 sick days per staff member has been noted-the lowest since 1999. This simply is down to sick people going into work whwn not fit for fear of job loss. My office, No consideration is given as to whether a referral needs to be made, it just is. The moral is at its lowest, no support but plenty of bullying. The worst management I have ever come accross. I'm sure its a way of reducing staff numbers before UC comes in to balance against costly redundancies. I am so unhappy in my work now & I used to enjoy my job. Whatever happended to looking after your staff & they look after you. Management to scared to deal with the people who take sick leave as if it where holiday & pick on those with genuine health issues. The above comments make for interesting reading and are, unfortunately, a sad reflection of what has recently happened to me. I am struggling with a whole raft of issues both outside and inside work. In a recent one to one with my countersigning manager I mentioned that I felt like I was on the knife edge of breaking point. Their response? A resondingly dissapointing "We all have our problems." It kind of goes with another response from a very senior manager "Life is difficult!" Well "No ***t Sherlock!" I feel so isolated and on my own. I write again with no expectation of a reply from the author of this article. I am within a couple of weeks of being sacked because I am unable to meet the target set. No-one on my section is able to meet this target, As i have a MH condition and am continually bullied to meet this target is it any wonder i fall short of it. I contemplated suicide at the end of last year because i was being called into meetings on a daily basis to be told i wasn't meeting my target. Thankfully I had a very good counsellor. The dept is hell bent on getting rid of people, as cheaply as possible, and the easiest people to beat into submission are those who have a mental health condition. There are at least 3 members of staff at my ex office under acute mental health services. I have long standing mental health problems but have worked for 24 years always at a high standard with DWP. Following a breakdown of mental and physical health, I was sacked for inefficiency after 3 months. The 6 point plan was invoked and I was threatened with police despite my husband working on site. Am appealing decision and pursuing ill health retirement. Conduct of senior and local management has been deplorable throughout and my health, both mental and physical, has been severely affected. Currently considering involving my MP to investigate management conduct and department behaviour in the DWP 'big hitter' site in which I worked. As an Ex employee, sacked due to Mental Health, I can see from the above that nothing has changed. Even despite mine being due to being attacked at work resulting in PTSD, I was passed off as not ill, right from HR to the top man from Surrey, not sick enough for medical retirement to even be considered? Gave them a bit of a shock at Tribunal when they had to concede I was covered under the DDA! As for the Union, they dropped me on the day of the Tribunal, but the House insurance took over, so make sure you pay to the right policy? Best bit, is once you claim ESA they still don't leave you alone. Just finished my stint in a psychiatric hospital due to harassment. Ho Hum! My mental health issues were caused by colleagues in the Home Office in 2005 from bullying that led to severe depression etc. I applied successfully through Capita for "injury at work" to classify this as "work related". Since 2005 I am still on medication for depression, anxiety, panic attacks, stress. All of the latter led to me being diagnosed with type 2 diabetes brought on by stress. The Home Office changed the sick absence policy and halved the days for triggers and removed the exemption for serious underlying medical condition. Someone like me will have a higher than average sick days. Fear of losing my job means I come to work against doctors orders and carry on. DWP have accepted that I have serious underlying medical conditions and mental health illness but the Home Office doesnt care. They cut posts where it is needed most on the front line which means picking up extra work without any thought as to wether the staff member can cope. So is this new strategy only on paper or will something be done to allow staff with disabilities to continue to work and be a valued employee who is treated with dignity not harrassment ???? I work in HMRC and people with genuine illnesses are scared to take time off sick and it's worse for those who suffer from Mental health issues, they are afraid to speak out in case they are picked on or fast tracked out of the department. Lynn mentions sick leave as being reduced since 2010 but that's because people take leave or come in unwell. We are now operating desk sharing so people don't always sit in the same desks and at times in different work areas away from their team, which isn't conjusive nor helpful. On top of this resources are being reduced and targets increased as a result more and more people are dealing with stress,anxiety over the pmr system which frightens people more than it helps - everyone scared of being a not met and again being managed out of the department as managers are under pressure to achieve targets and less time to care about their staff! i have never made a comment on these sites before. However reading the comments above I have to say a few words. There seems to be a lovely picture being painted by the latest outcome by senoir management to help those with metal health. By reading above that is clearly not the case. So I say;; stop making these policy statements when they are not fulfiled. I read that there is an online tool that you can use. What! Are we "Robots"? Surly, line management need training every 2 years or so as some are not taking any notice, but just make people worst. The other aspect which I have indicated is where is HR in all this? Well phone and yes you know -- press this -- press this -- press this button. This is more stress. There is a lot of mention getting into groups to talk. Great, but from where i work this just do not happen. Face to face is best with those who are trained. I could go on but I best not. I am worried that I will be rid of at the moment I was recently diagnosed with depression and have an upcoming occupational health appointment as my performance has deteriorated over the past 6 months, as usual I was the last to realise that I was withdrawing and was not doing well as expected. I have had the death of my father and a cancer investigation over 4 months which has scared the blazes out of me this year. I was unable to talk for the fear of further attack over my figures v targets through to the point I could not hide it anymore and went to tears in the office of my manager who had been beating me over figures. I really do hope through occupational health I will get some help and not be just found not fit for duty and dismissed, as over and throughout this I have only had 4 days off in the past 4 years, I want to continue working. It is incredibly frustrating and irritating to hear the government blag on about work being 'good' for our mental health when in fact SO MANY people have miserable lives because of work-related stress. Have they never heard of 'Monday-blues'? Are they totally oblivious to why people look so miserable every morning travelling to work? Have they got no contact with individuals or have employees who are CIPD qualified that have actually studied an atoms worth of employee/human psychology and actually care? Part of the reason why I (and numerous other people) have mental health issues is because of our working lives. We are under serious strain with poor work-life balance. Whether you are in Civil Service or not, for starters, our pay levels in this country is a joke! There is no reward for the work you do. Even further, I have studied HR to the Masters Degree level and I can say that HR, when it comes to the transition of theory to implementation is almost non-existent. For crying out loud, the government seriously needs to get REAL!